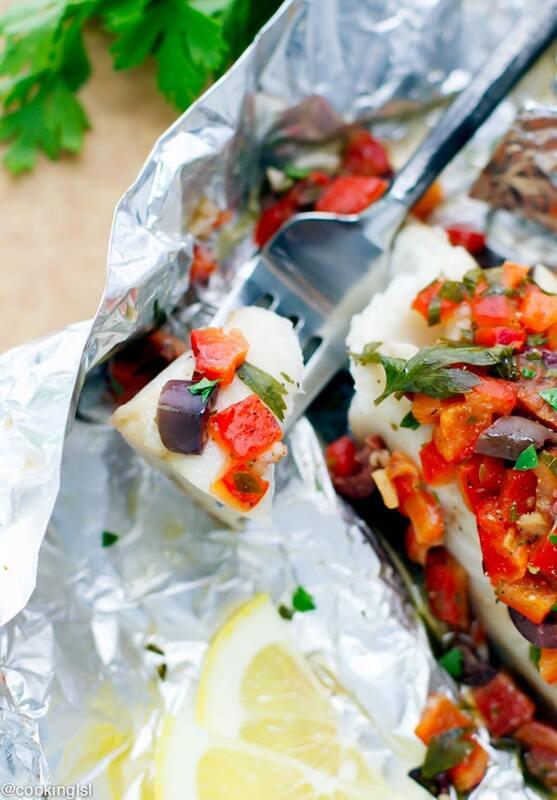 Sablefish In Foil With Peppers And Olives – a light dish, made with just a few ingredients and ready in 20 minutes. You can substitute with cod fish or tilapia if you can’t find sablefish. It is extremely cold around here and I can’t wait until Friday, when it is supposed to warm up a little, so I can make this fish again! Sablefish, also known as “black cod” and a few other names is white fish, with light texture and mild flavor. I got mine from Sizzlefish. Feel free to check out their products here. I eat fish once a week. The way I usually prepare it is on the grill. I don’t really mind grilling in the winter. But I often overcook my fish on the grill… Not that I don’t know how long it takes to cook, but I’m always multitasking and a minute or two can easily ruin your fish. Especially when your grill is is huge and powerful like ours. I think I have a solution – next time you decide to grill some fish – wrap it in foil. You won’t be sorry! And you can also add in some peppers and olives like I did in this recipe. I have a friend who absolutely refuses to cook fish, unless it is in foil. No wonder he always makes the best fish! 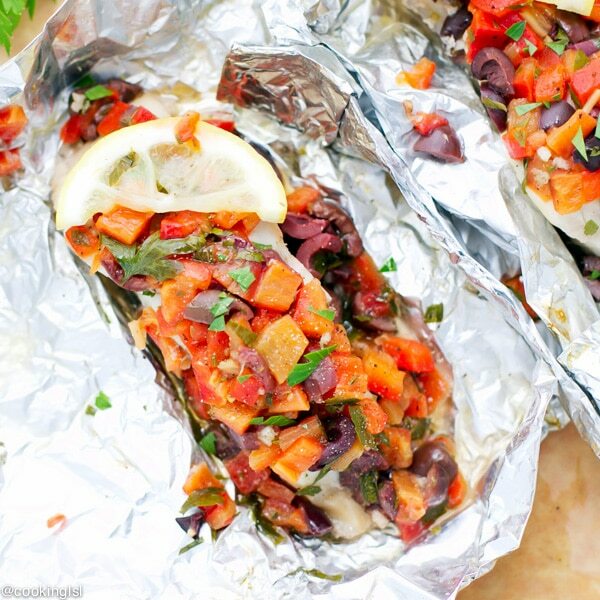 You can wrap fish in foil and grill it or even bake it. It will stay moist and full of flavor. There also will be less dishes to wash. In this recipe I decided to go with a mix of peeled and chopped roasted red peppers, kalamata olives, lemon juice and parsley. I topped the fish with the mixture, then wrapped it tightly in the foil and grilled it at 400F for 15 minutes. The peppers and olives bring just enough flavor to the fish while keeping the dish still light. 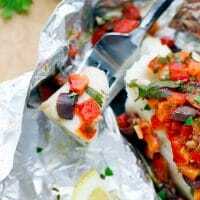 Sablefish In Foil With Peppers And Olives - a light dish, made with just a few ingredients and ready in 20 minutes. 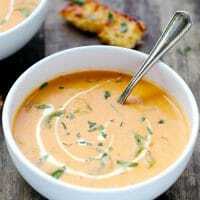 You can substitute with cod fish or tilapia if you can't find sablefish. Preheat gas grill to 400F. Clean grates. In a bowl combine garlic, lemon juice, olive oil, olives, peppers, parsley, salt and pepper. Cut 2 large pieces of foil. Spray the inside with oil spray. Place fish in the middle. Spread 1/2 of the mixture on top of each fish fillet. Crimp foil and wrap the fish in it. Grill at 400 F for 15 minutes. Carefully open the foil and serve. I have never heard of sablefish before. 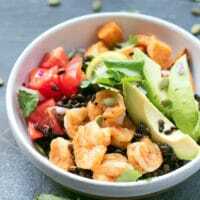 I just love the Mediterranean topping on this and it is making me think of being on a Spanish island, as it’s SO cold here today. I love eating fish this way! 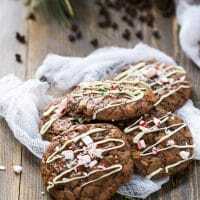 so easy and delicious!!!! This is absolutely beautiful, Mira!!! This is the perfect way to cook fish Mira! It looks amazing. I love the pepper and olive mixture on top too, it has so many great flavours! Wow, you just made fish look 1) easy to prepare and 2) appetizing to the extreme! I struggle with fish, mine always tastes so fishy. But I think the olives and red peppers would offset any fishiness. And this is a warm meal. Much needed right now! This looks so beautiful, Mira! We love fish and my husband grills all year long so I am definitely adding this to our dinner menu! So healthy and delicious! I’ve never heard of sablefish, but I love white fish, so I’m sure I’d like sablefish too! 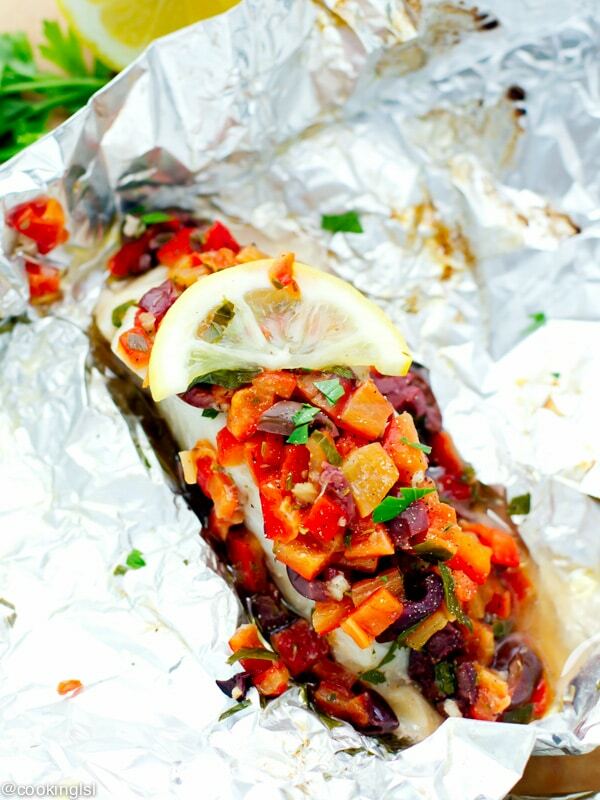 Cooking fish in foil is a great idea, it makes a great presentation and prevents the fish from crumbling into the grill! This fish looks mouthwatering! Who can complain about less dishes to wash? I know I can’t! Cooking the sablefish in foil was a great idea. It looks delicious, Mira! You are right-on with wrapping it in foil! I also have a good friend who only prepares it that way and it’s always so tender and flaky. I love the combination of flavors you have going on here, Mira! So bright and delicious! This is my favorite way to prepare fish, but I’ve never had sablefish. I need to try this. Thanks Sonali! Happy New Year! 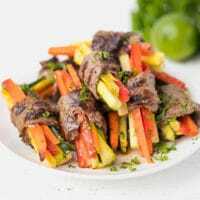 I love the Mediterranean flavors in this dish! 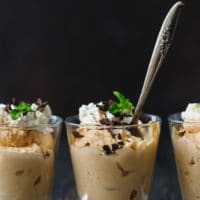 This is something that I would eat all the time during the week – quick, easy, and incredibly delicious! I get distracted too and then cook things too long. But when you wrap it up, the fish steams so nicely! And this looks delicious. Those veggies look incredible! This fish looks SO moist and fall-apart tender, Mira! 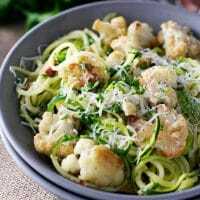 I love all those gorgeous veggies on top too! Love this way of cooking fish! I’ve never tried sablefish before, but it sounds and looks delicious with the addition of peppers and olives. 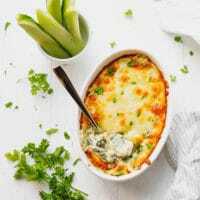 Gorgeous dinner recipe! Thanks for sharing, Mira! I eat fish a lot too, Mira and you can’t go wrong with fish in foil or parchment paper! LOVING the flavors you used! 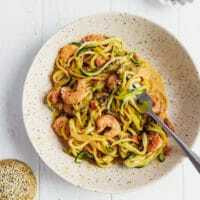 This looks absolutely perfect – light, healthy and seriously satisfying! Pinned! Cheers, doll!